A deep ocean current with a volume equivalent to 40 Amazon Rivers has been discovered by Japanese and Australian scientists near the Kerguelen plateau, in the Indian Ocean sector of the Southern Ocean, 4,200 kilometres south-west of Perth. 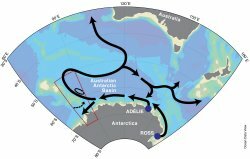 In a paper published in Nature Geoscience, the researchers described the current –more than three kilometres below the Ocean’s surface – as an important pathway in a global network of ocean currents that influence climate patterns. “The current carries dense, oxygen-rich water that sinks near Antarctica to the deep ocean basins further north,” says co-author Dr Steve Rintoul from the Antarctic Climate and Ecosystems CRC and CSIRO’s Wealth from Oceans Flagship. “Without this supply of Antarctic water, the deepest levels of the ocean would have little oxygen. While earlier expeditions had detected evidence of the current system, they were not able to determine how much water the current carried. The joint Japanese-Australian experiment deployed current-meter moorings anchored to the sea floor at depths of up to 4500m. Each mooring reached from the sea floor to a depth of 1000m and measured current speed, temperature and salinity for a two-year period. “The continuous measurements provided by the moorings allow us, for the first time, to determine how much water the deep current carries to the north,” Dr Rintoul said. The current was found to carry more than 12 million cubic metres per second of Antarctic water colder than 0 °C (because of the salt dissolved in sea water, the ocean does not freeze until the temperature gets close to -2 °C). “It was a real surprise to see how strong the flow was at this location. With two-year average speeds of more than 20cm per second, these are the strongest mean currents ever measured at depths three kilometres below the sea surface. “Mapping the deep current systems is an important step in understanding the global network of ocean currents that influence climate, now and in the future. Our results show that the deep currents near the Kerguelen Plateau make a large contribution to this global ocean circulation,” Dr Rintoul said. Antarctic waters carried northward by the deep currents eventually fill the deep layers of eastern Indian and Pacific Oceans.